International Journal of Research in Health Sciences,2015,3,2,364-368. 1-Professor & HOD, 2,3-Associate Professor, 5-Post graduate 4-Associate Professor of Pathology, Department of Pathology, Fathima Institute Of Medical Science, Kadapa., AP., Department Of Pathology, Santhiram Medical College, Nandyal, AP., INDIA. Soft tissue is a non epithelial extra skeletal tissue of the body, represented by the voluntary muscles, adipose tissue and fibrous tissue along with the vessels serving these tissues. They are classified according to the tissue they originate (muscles, fat, fibrous tissue and nerves) . A five years (January 2010 – December 2014) retrospective study of soft tissue tumors was done at Santhiram Medical College, Nandyal, Kurnool. The present study comprises of all soft tissue tumors both benign and malignant tumors obtained during the five years. The tissues were fixed in 10% formalin, processed and sections were stained by hematoxylin and eosin. The clinco pathological correlation was done and the histomorphological diagnosis was made. 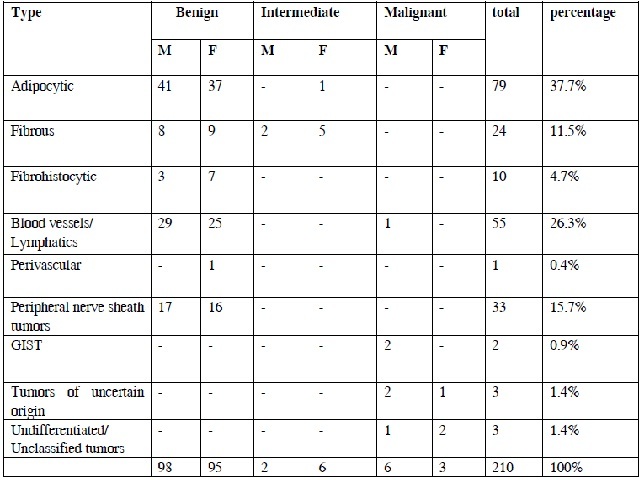 The total 210 soft tissue tumors were analysed on the available clinical data from the hospital records. Among the 210 soft tissue tumours, 193(92%) cases were benign soft tissue tumors and 9(4.2%) were malignant. The benign to malignant ratio was 21:1. The benign tumors were 1.2:1 ratio and tumors had prelidiction for extremities and head and neck . The malignant tumor had slightly male predominance with male to female ratio of 2:1. The tumors were classified according to WHO classification with available modern diagnostic methods, wherever required . The clinico pathological evaluation is still the gold standard for the diagnosis of the soft tissue tumors.